The New York Rangers will open the 2013 season with a back-to-back set beginning on Saturday, January 19, with an Original Six matchup at Boston. This will mark the fifth consecutive season the Rangers will open their regular season campaign on the road, and the 11th time in the last 13 seasons. The Rangers will complete the back-to-back set to begin the season with their home opener at MSG on Sunday, January 20, with an Atlantic Division matchup against the Pittsburgh Penguins. 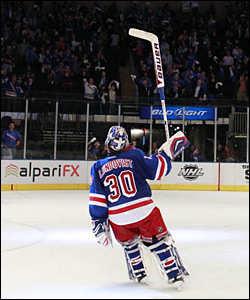 Henrik Lundqvist and the Rangers will play 24 home games on MSG ice between Jan. 20 and April 27. The Rangers will only face Eastern Conference opponents in a 48-game schedule that features 18 games against Atlantic Division opponents, and 15 games apiece against Northeast Division and Southeast Division opponents. New York will face Atlantic Division foes Pittsburgh and Philadelphia five times each, hosting the Penguins three times at MSG while playing the Flyers twice on home ice. The Blueshirts will also face New Jersey and the New York Islanders four times apiece. New York will face Northeast Division and Southeast Division opponents three times each. The Rangers will host Toronto, Florida, Tampa Bay, Washington and Winnipeg two times each. Meanwhile, the Blueshirts will travel to Boston, Buffalo, Montreal, Ottawa and Carolina two times apiece. The schedule features two Saturday contests at MSG, including the season finale against New Jersey on April 27, and six Sunday contests at home. The Rangers will play six back-to-back sets in the shortened season. The team’s longest homestand will be four games, from February 26 against Winnipeg to March 5 against Philadelphia, while their longest break in between home games will be nine days from March 9 to March 17. The busiest month on the Blueshirts’ home schedule is February, featuring seven contests at MSG, and the busiest nights on the Rangers’ home schedule are Sunday and Thursday, with six dates each. In addition, the Rangers will play two home games on Mondays, four on Tuesdays, three on Wednesdays, and one on Fridays during the season. New York will finish the regular season with 16 of their last 25 games away from MSG, including 11 of their last 17 contests. Starting times for all games at MSG will be 7:00 PM, except for the following nine dates: Wed., Jan. 23 vs. Boston (7:30 P.M.); Sun., Feb. 10 vs. Tampa Bay (7:30 P.M.); Sun., Feb. 17 vs. Washington (6:00 P.M.); Sun., Mar. 3 vs. Buffalo (7:30 P.M.); Tue., Mar. 5 vs. Philadelphia (7:30 P.M.); Wed., Apr. 3 vs. Pittsburgh (7:30 P.M.); Wed. Apr. 10 vs. Toronto (7:30 P.M.); Sun., Apr. 21 vs. New Jersey (TBD); and Sat., Apr. 27 vs. New Jersey (TBD). Single-game tickets will be put on-sale to the public on Wednesday, January 16.